2. I use Shape Flex for interfacing on the EXTERIOR only. 3. After the sides of the pouch are sewn together, I clip the corners if I'm making a square pouch and clip curves if I'm making rounded corners. 4. I use a longer stich (3.0 setting on my BabyLock) to topstitch than I do to assemble the pouch. 5. For this video and the pouches sewn, I used a 7" zipper, but the zipper tape was 8.5" long. My fabric was cut 8.5"x6.5"
6. Other than when I attach the zipper, I use a 3/8" seam allowance when assembling the pouch. Here's the video! If there is enough interest in a longer version, I could probably show one from start to finish, but I feel there are lots of great tutes out there already. It's usually just the zipper attachment people struggle with or fear so that's what I focused on. 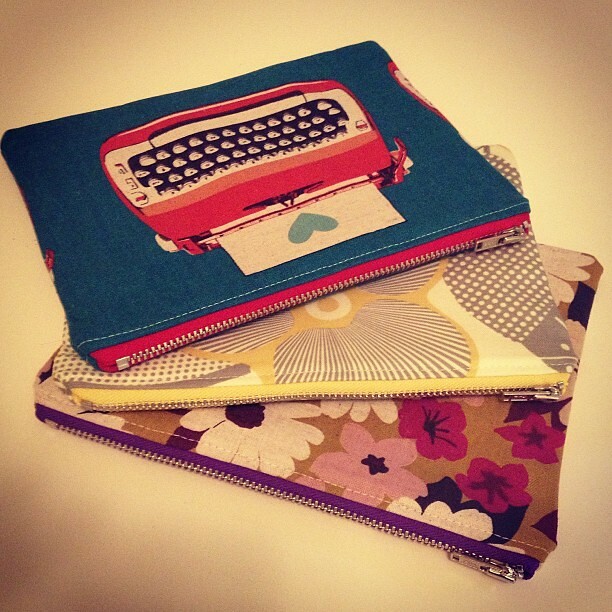 weird -- I'm sewing typewriters into pouches over here today. Great video. That makes me want to try a pouch!! Excellent video! Thanks for sharing! 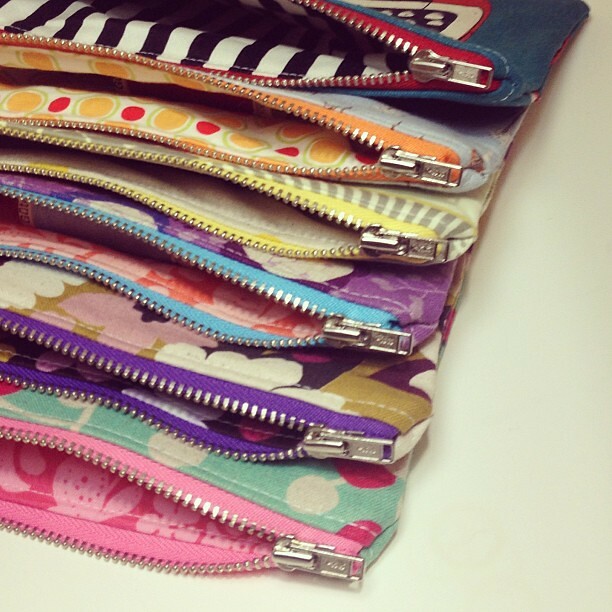 I still have a zipper pouch I want to make as a Christmas present so this is PERFECT timing! I used your other pouch tutorial and was a little confused with the top-stitching and now I understand. Thank you! Nicely done! Thanks for sharing. Unzipping that zip makes all the difference, doesn't it? I've sewn many a zipper pouch but continue to struggle with fabric shifting and getting everything to line up correctly. 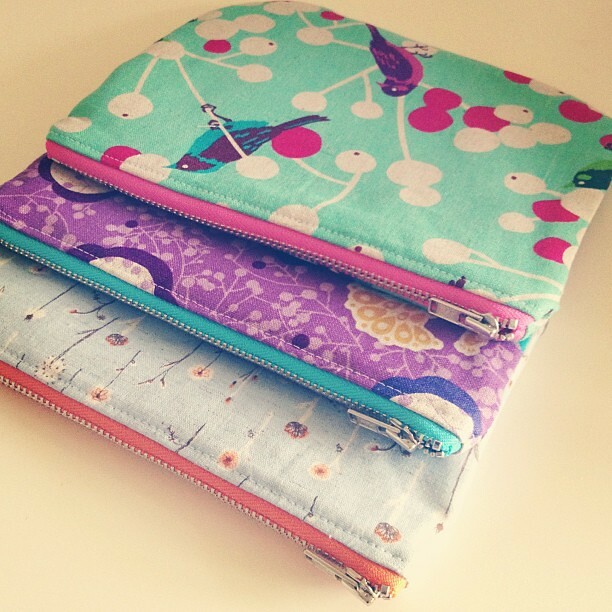 I think your video and tips may just revolutionize my zipper sewing! :) Thanks so much! Your zippers look great! And I'm a big fan of kungfucowgirl at Zipit, too!! Thanks for the tutorial. I love that you get a nice finished look without fiddling with tabs! We all need challenges in our life to keep motivated. I really had a great time scanning and reading your blog site and i was so amazed with your great artwork. I do hope you could inspire more readers. You can also visit my site for some interesting stuff. I'm a 35 year-old mom of 2 boys and 2 dogs. I've moved 18 times! My law degree is collecting dust, much to my parents' dismay. I started sewing in January of 2010 so I need all the help I can get. I ♥ my flickr and IG friends for all their great swaps and advice! Handmade Christmas 2012 is Done!